If there’s one thing I’ve gathered from trying to badger various Porsche LMP1 team personnel about what they’re doing next year, it’s that all their energies are focused on going out with another championship until they figure all that out. And holy crap, they are quick. 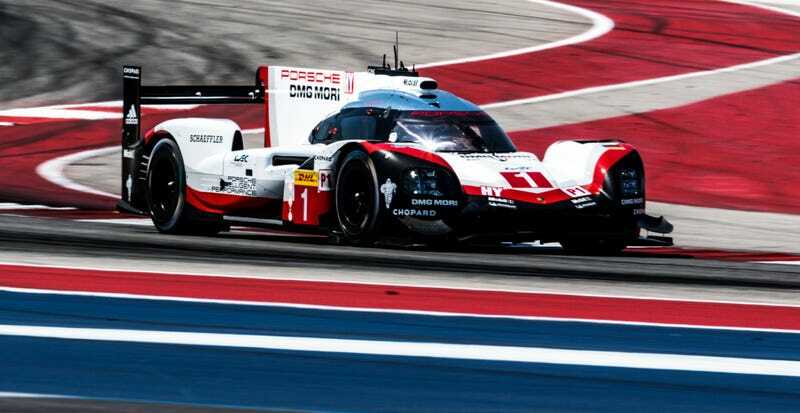 Porsche will start from the first and second positions overall for the World Endurance Championship’s 6 Hours of Circuit of the Americas—the second time in a row the Porsche team has done that this season. This is the first time that the No. 1 Porsche 919 duo of Neel Jani and Nick Tandy claimed pole position, though. Jani laid down an ridiculously quick fastest lap of 1:44.656. The WEC uses an average of the two qualifying drivers’ fastest lap times to determine its starting order, but even then, Tandy and Jani’s average was a 1:44.741. The fastest No. 8 Toyota’s qualifying average was a full 1.659 seconds behind the No. 1 Porsche. Porsche isn’t here to wither away quietly after they announced the closing of their LMP1 program at the end of this year. Several members of that team mentioned an unspecified drivetrain project involving an efficient combustion engine for something—somewhere. (No one would say exactly what that was, be it on the road or off.) Either way, these last few races feel like they’re trying to make a statement that the team is capable of some pretty incredible stuff. The rest of the field should be ridiculously fun to watch. Only 0.37 seconds separate the top four LMP2 cars’ qualifying averages, with the No. 36 Signatech Alpine taking pole. 1.329 seconds covers the qualifying averages of the entire LMGTE Pro class, where the No. 71 AF Corse Ferrari just edged out the No 67 Ford GT for pole position. The No. 98 Aston Martin took the LMGTE Am pole position handily, with a qualifying average over a second faster than the next No. 54 Spirit of Race Ferrari 488 GTE. Full qualifying results can be viewed here. If you can figure out how to be in Austin tomorrow to see Porsche’s last 919 Le Mans prototype run, you should come. While the Toyotas weren’t as fast in qualifying, all four top-class still have to last all six hours of the race, and I don’t think Toyota wants to let Porsche run away with this.